I'm building a puzzle for an escape room. I want to give the user 6 wires and 6 terminals, then confirm that they've connected the correct wires to the correct terminals (one-to-one). My first (successful) attempt to implement this puzzle was to connect the wires to 6 PWM analog outputs set to different levels, and connect the terminals to 6 analog input pins. By time-averaging the readings on the input pins, I was able to determine which wire(s) are connected to which terminals, if any. I currently have no resistors in the circuits. Connect multiple wires to the same terminal. Connect multiple wires together, without connecting them to any terminal. Touch multiple exposed wires and/or terminals. Is my current approach dangerous, either for the Arduino or my users, and are there recommended precautions I should take? Is there a better (safer or simpler or more robust) way to implement the puzzle? I'm a software engineer, but a complete noob when it comes to real electronics and Arduino, so please feel free to assume I know nothing. First, let's consider the logic of your program. You have two groups of pins: 6 pins connected to the wires and 6 pins connected to the terminals. The first thing I would do is forget that these are two different groups. Consider you just have 12 pins that the user has to connect in a specific fashion. This way most “weird things” the user could do, like connecting wires together, are not a special case anymore. They are just another invalid combination. Now what you have to do is, for every pair of pins among those 12, determine whether or not they are connected together. If any pair is connected that shouldn't be, you have an invalid combination. If any pair is not connected while it should be, it's again an invalid combination. If every pair is the expected state (either connected or not connected), then the user did solve the puzzle. Now, for the hardware side. A simple way to know whether two pins are connected together is to set one of them to INPUT_PULLUP and the other one to OUTPUT LOW. This second pin should be the only one accessible to the user that outputs a LOW. All other exposed pins should be set as either INPUT or INPUT_PULLUP. Now, if the first pin reads LOW, you know have a connection. If it reads HIGH the two pins are not connected together. Here is an example program demonstrating that principle. It loops over the 66 possible pairs to check whether they are connected or not. You just have to replace the inner if with your code that validates the combination. // Set all pins to INPUT_PULLUP. // Loop over all pin pairs (pins[i], pins[j]). // Set pins[i] to OUTPUT LOW, then read pins[j]. As for the safety, you should be fine as long as the users do not have access to any low-impedance ground or voltage source. In particular, the GND and 5V pins should not be user-accessible. For extra protection, you could put a 1 kΩ resistor in series with each pin, but then all the pins that are not actively being tested should be set to INPUT rather than INPUT_PULLUP, otherwise multiple pullups in parallel may start to compete with the series resistor. I would also connect the terminals to the 6 analog input pins and have 6 unique voltages, one per wire. The Arduino will only provide the output when the 6 wires are placed on the correct terminals. In other words, that is when the Arduino sees the correct analog voltage on the respective pins. I personally would add a RC Low pass filter to the output of the PWMs. More information here. Your PWM output would go into the Vin and the then the Vout would go to your wire (ie the analog input). One filter per channel. The RC filter will protect the Arduino from shorts to +ve, Gnd and the other pins as well as providing a bit of protection from static. It will also simplify your code. At the moment you are having to implement fancy code to average out the voltage on those analog pins. The RC filter would essentially make that code not needed. To calculate the value of the resistor and capacitor you need: There is a very good article over at All About Circuits that goes into this subject in detail. I used http://sim.okawa-denshi.jp/en/PWMtool.php to calculate the values of R & C needed with a very low ripple ( < 60mV ) using common values. I based my calculations around the 490Hz as the lower frequencies perform worst with low pass filters. I suggest you use values of R = 10k and C = 4.7uF. You can play with these values until you get the output you desire. One last thing I would consider is to put some protection on the terminals that connect to the analog pins. This could be a small resistance in series, or a 5.1V zener in parallel (the pin may already have this?) or some capacitance in parallel. The only minor downside I'm noticing is that if the user has two wires connected to the same terminal, it affects all the voltages read across the other terminals, making it hard to give the user incremental feedback on how many wires are correctly connected. 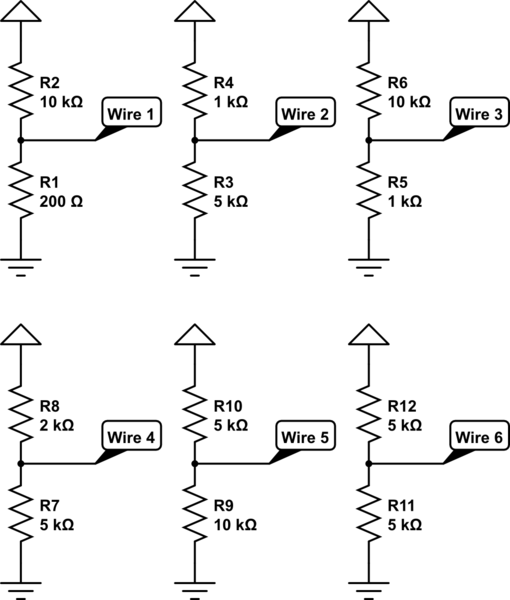 This can easily be solved by providing 6 individual voltage divider networks, as shown below. Notice how each voltage divider has a different ratio. Not the answer you're looking for? Browse other questions tagged analogread analogwrite safety or ask your own question.